GREENSBORO - Carolina makes a big move, signing offensive lineman Bill Vavau (6’4”, 320) from Utah State for 2019. 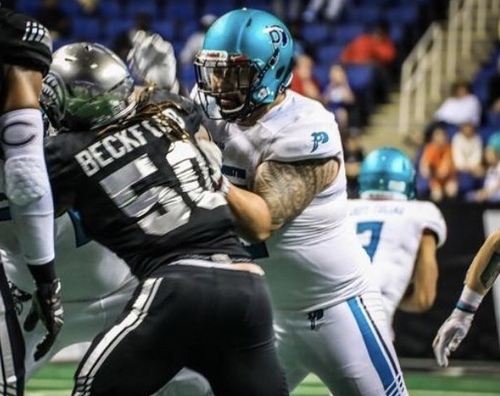 Vavau played in ten games for the Massachusetts Pirates in 2018, including their 50-36 loss to the Columbus Lions in the playoff semi-finals. Prior to his time with the Pirates, Vavau played ball for the Spokane Empire in 2017 and with the Colorado Crush from 2015-2016, with both teams coming from the IFL. “Every season we have played against Bill he has been a headache on the field and a class act off it,” says head coach Billy Back. “He was a total dominant player this past season for Massachusetts on both sides of the ball. We look forward to having him do the same here, this is a huge signing for us,” Back finishes ecstatically. Vavau played at Snow College from 2011-2012 before playing in 16 games for the Utah State Aggies from 2013-2014. He originates from West Jordan, Utah, where he played football at Jordan High School.